A Muff teenager who almost died in a road accident earlier this year is making a miraculous recovery. Jake McGrath, from Craig Road, was a passenger in a car that crashed close to the Rock Bar between Muff and Burnfoot last April. The fourteen-year-old suffered a critical brain injury that left him perilously close to death on a life support machine in Belfast’s Royal Hospital. Jake’s father Gerard passed away two years ago but his mother, Caroline, has maintained a bedside vigil since the horrific crash almost four months ago. Against the odds however Jake clung to life and began to show signs of improvement. He emerged from a coma and has now been deemed well enough to be transferred from the Royal to Letterkenny. “He is still unable to talk because there is something wrong with the left side of his throat but he knows that we are there with him; he is able to give the thumbs-up if you talk to him. He is pretty alert even though he can’t speak,” Helen revealed. Jake continues to require round-the-clock medical attention, but having him back in Donegal has made things a little easier. “He still needs a lot of nurses’ care but it’s much better for the family to have him in Letterkenny. His mother wanted him nearer home for the rest of the children,” Helen said. It is not going to be an easy road for the teenager – he must learn to walk and talk again – but his family remains hopeful. They are delighted that he has made it this far. “Hopefully he will be able to talk and walk again with the right physiotherapy. We thought there was no hope but thank God things have changed and a lot of prayers have gone long way,” Helen added. 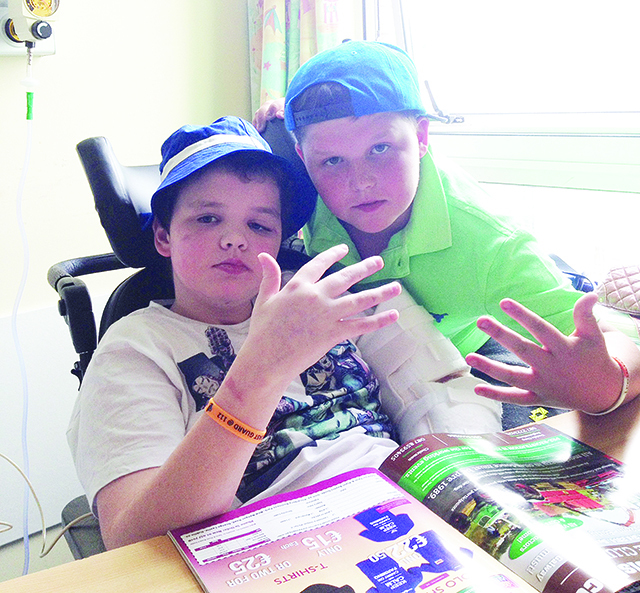 With a fundraiser to aid Jake’s recovery planned for next week, Helen said the local community has been very supportive. “People have been great; they are asking about him all the time. It lifts our heart when we know that people are talking about him and thinking about him,” she added. next Wednesday, August 6 from 10am to 2pm.